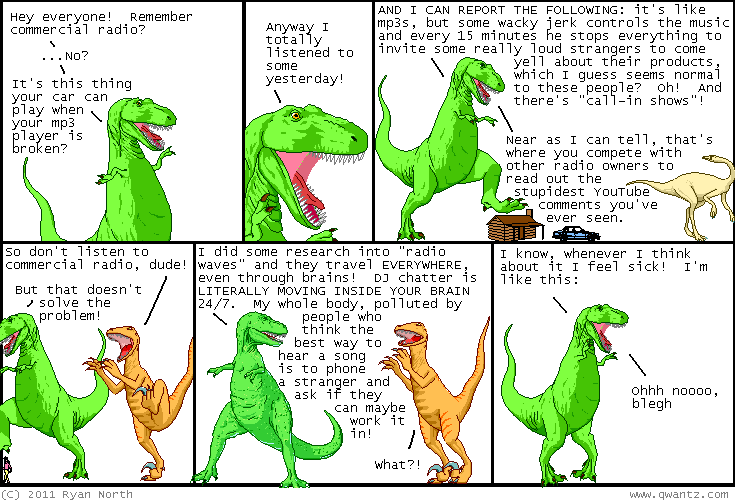 Dinosaur Comics - December 19th, 2011 - awesome fun times! December 19th, 2011: Today is Feel Free To Talk To Me If I'm Wearing A Dinosaur Comics Shirt Day! It's happening worldwide RIGHT NOW. THE PLANET IS CHANGING AS WE SPEAK. Everyone, feel free to go for it! And let me know if any friendly good times result from it, okay?? TONIGHT is my combination holiday party / book release party for my new book! We're doing a secret Santa gift exchange and Joey Comeau is gonna ask me personal questions on stage. SHOULD BE FUN?? Finally, I'm sorry but TopatoCo has called all shipping deadlines - you guys just ordered too much stuff! We were down to the last few deadlines anyway, but if you order now and were hoping for delivery by December 24th, the safety of that hope is no longer guaranteed.